The Day Louisiana teenager Rory Deveaux arrives in London marks a memorable occasion. For Rory, it's the start of a new life at a London boarding school. But for many, this will be remembered as the day a series of brutal murders broke out across the city--gruesome crimes mimicking the horrific work of Jack the Ripper in the autumn of 1888. 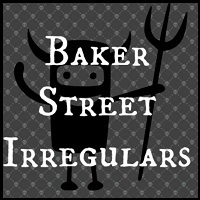 Soon "Rippermania" takes hold of modern-day London, and the police are left with few leads and no witnesses. Except one. Rory spotted the man police believe to be the prime suspect. But she is the only one who saw him. Even her roommate, who was with her at the time, didn't notice the mysterious man. So why can only Rory see him? And more urgently, what is he planning to do about her? I haven't read a lot of YA in a long time, at least a couple years, maybe, or four. Honestly, I don't remember, because I just kind of drifted away from it. I might have read one YA book here and there, but I think I eventually gave up picking up anything YA unless by an author I know I love. But all of that isn't really the point of this review. 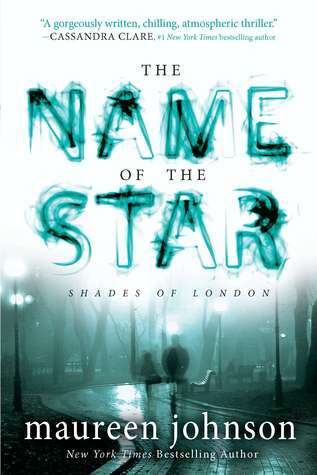 I'm glad that I randomly chose The Name of the Star as my read for his year's Halloween Bingo, for the Baker Street Irregulars square (see end of post). And I'm glad that it turned out much more interesting and fun than I had initially anticipated. Mind you, I didn't expect it to be bad or anything, I just wasn't really expecting anything at all. But I found myself quickly loving Rory's tone and her dry snark, and her random tendencies to get excited about the strangest things--like no hockey today!--and loved that she was extremely honest. And I loved that she wasn't the typical mopey, outcast, and misunderstood YA heroine who is hated on by all the girls, but whom every male has a secret lusting attraction towards. Rory was just an ordinary girl who traveled to England for high school, who became just another student at Wexford, who made friends and went to class and stressed about homework, like any other normal high school girl. She had friends, both boys and girls, and there were no mean girls or overly broody alpha boys. And then she picked up a fancy new gift after a near death experience, and ended up being the sole witness of a Ripper murder. The truth is, I normally would have hated how dragged out a lot of this book ended up being in the beginning, and even some parts in the middle. There was a very mundane, everyday feel to each chapter, like a boring "A Day in the Life of Aurora Deveaux." But Rory's voice and her telling was actually kind of fun, and while a lot of detail was probably excessive, I found I enjoyed the short tangents into her family and her life back in Louisana. Call me contradictory, because I probably would have condemned another book for being so banal. But Rory made it interesting. It took a while for the actual story to start up, truth be told, and meanwhile, there was a nagging voice in the back of my head wondering if we were ever going to get Rory involved in these Ripper copycat murders. And the moment she starts seeing the ghosts, it wasn't hard to figure out how things would go from there--aside from the continuation of mundane, everyday activities, because I hadn't expected the book to keep that up. I suppose for many others, this book might come off boring, as there is very little action, and a lot more focus on Rory's school life and her interactions with her fellow Wexford classmates. I would have liked to have seen more scenes with her and the squad of youths known as the Shades, really, but I'm guessing that will take place more in later books.